Handles path calls for a single unit. This is a component which is meant to be attached to a single unit (AI, Robot, Player, whatever) to handle its pathfinding calls. It also handles post-processing of paths using modifiers. Stop calculating the current path request. If true then the path will be pooled when the pathfinding system is done with it. If this Seeker is currently calculating a path it will be canceled. The callback (usually to a method named OnPathComplete) will soon be called with a path that has the 'error' field set to true. This does not stop the character from moving, it just aborts the path calculation. Called by modifiers when they are disabled or destroyed. Path that is currently being calculated or was last calculated. You should rarely have to use this. Instead get the path when the path callback is called. Is the current path done calculating. Returns true if the current path has been returned or if the path is null. Do not confuse this with Pathfinding.Path.IsDone. They usually return the same value, but not always since the path might be completely calculated, but it has not yet been processed by the Seeker. Releases any eventually claimed paths. Calls OnDestroy on the startEndModifier. Draws gizmos for the Seeker. Called by modifiers to register themselves. Releases the path used for gizmos (if any). The seeker keeps the latest path claimed so it can draw gizmos. In some cases this might not be desireable and you want it released. In that case, you can call this method to release it (not that path gizmos will then not be drawn). If you didn't understand anything from the description above, you probably don't need to use this method. Runs modifiers on a path. Starts a Multi Target Path from one start point to multiple end points. Mask used to specify which graphs should be searched for close nodes. See Pathfinding.NNConstraint.graphMask. A Multi Target Path will search for all the end points in one search and will return all paths if pathsForAll is true, or only the shortest one if pathsForAll is false. Starts a Multi Target Path from multiple start points to a single target point. A Multi Target Path will search from all start points to the target point in one search and will return all paths if pathsForAll is true, or only the shortest one if pathsForAll is false. Call this function to start calculating a path. Since this method does not take a callback parameter, you should set the pathCallback field before calling this method. The callback will be called when the path has been calculated (which may be several frames into the future). The callback will not be called if a new path request is started before this path request has been calculated. Since 3.8.3 this method works properly if a MultiTargetPath is used. It now behaves identically to the StartMultiTargetPath(MultiTargetPath) method. Since 4.1.x this method will no longer overwrite the graphMask on the path unless it is explicitly passed as a parameter (see other overloads of this method). Mask used to specify which graphs should be searched for close nodes. See Pathfinding.GraphMask. This will override graphMask for this path request. Mask used to specify which graphs should be searched for close nodes. See Pathfinding.NNConstraint.graphMask. 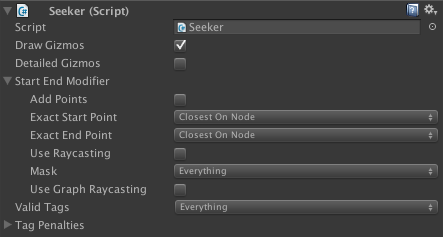 This will override graphMask for this path request. Enables drawing of the non-postprocessed path using Gizmos. The path will show up in orange. Requires that drawGizmos is true. This will show the path before any post processing such as smoothing is applied. Enables drawing of the last calculated path using Gizmos. The path will show up in green. Graphs that this Seeker can use. This field determines which graphs will be considered when searching for the start and end nodes of a path. It is useful in numerous situations, for example if you want to make one graph for small units and one graph for large units. Note that this field only stores which graph indices that are allowed. This means that if the graphs change their ordering then this mask may no longer be correct. Some overloads of the StartPath methods take a graphMask parameter. If those overloads are used then they will override the graph mask for that path request. Callback for when a path is completed. Movement scripts should register to this delegate. Called after a path has been calculated, right before modifiers are executed. Called before pathfinding is started. Path modifier which tweaks the start and end points of a path. This array should always have a length of 32 otherwise the system will ignore it. The tags which the Seeker can traverse. Used for serialization backwards compatibility. The path ID of the last path queried. Internal list of all modifiers. Called once for a MultiTargetPath. Only returns the path, does not post process. Called for each path in a MultiTargetPath. Only post processes the path, does not return it. Cached delegate to avoid allocating one every time a path is started. Called when a path has completed. Internal method to start a path and mark it as the currently active path. Temporary callback only called for the current path. Returns a new path instance. The path will be taken from the path pool if path recycling is turned on. Use ABPath.Construct(start, end, null) instead. Starts a Multi Target Path. Takes a MultiTargetPath and wires everything up for it to send callbacks to the seeker for post-processing. Since 3.8.3 calling this method behaves identically to calling StartPath with a MultiTargetPath. Since 3.8.3 this method also sets enabledTags and tagPenalties on the path object. You can use StartPath instead of this method now. It will behave identically.